Feld Entertainment, parent company of Ringling Bros. and Barnum & Bailey, has announced that 13 performing elephants will be off the road by 2018. Alana Feld, executive vice president of Ringling Bros told the Associated Press “There’s been somewhat of a mood shift among our consumers… A lot of people aren’t comfortable with us touring with our elephants.” President Kenneth Feld conceded that ordinances restricting traveling circuses using wild animals had made it difficult to plan tours. ADI is calling on Ringling Bros to give up all wild animal acts. The promise is not legally binding and the circus could be testing the water. Roars for the Fountain City Lions Club in Indiana which canceled the appearance of Nosey the elephant at their Levi Coffin Days Festival recently. Our thanks as well to the voices raised in unison from grassroots advocates and other organizations and to Lions Club International who requested Nosey not be involved in the event. Nosey’s owner, Hugo Liebel conceded, “It is what it is. Times are changing.” Thirty-two members of Congress signed a letter to US Secretary of Agriculture Tom Vilsack calling the USDA to task citing “insufficient” evaluations where Nosey continues to tour despite “long-term abuse,” “serious, willful, chronic violations,” and “repeated noncompliance” in veterinary care, handling, housing, and husbandry. Congratulations to New Jersey’s West Deptford Lions Club for severing ties with Cole Brothers Circus in response to local concerns. We thank ADI volunteer Joan Conn for her efforts and all the local advocates who helped influence the decision. 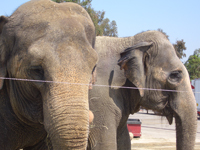 The Al Malaikah Shriners in Los Angeles have decided not to bring an animal circus to their annual event! The move follows several years of ADI outreach and discussions with local Shriners.